To take in the sails of a vessel and secure them with gaskets. In the case of square-rigged ships, to haul in on the clew-lines and buntlines and roll sails up to the yards. In the case of fore-and-aft rigs, to lower and secure sails to the boom or stays. the upper main topsail. We have had several hard squalls during the day, my hands feel pretty cold when I get aloft; it makes me think of the last time I was over this ground, it is lucky it is summer." Feb. 2: "Well we have got around the first corner in thirty-six days without having much bad weather. I am glad we are heading for a civilized country once more." Sailors' nickname for Cape Horn. but not out of the weather." Feb. 6: "This afternoon I have been a boring holes in some boxes for putting in potatoes." A caulking material made of tarred rope fibers. until two bells, then greased the mate's boots. We were becalmed all night and during the day, also foggy." 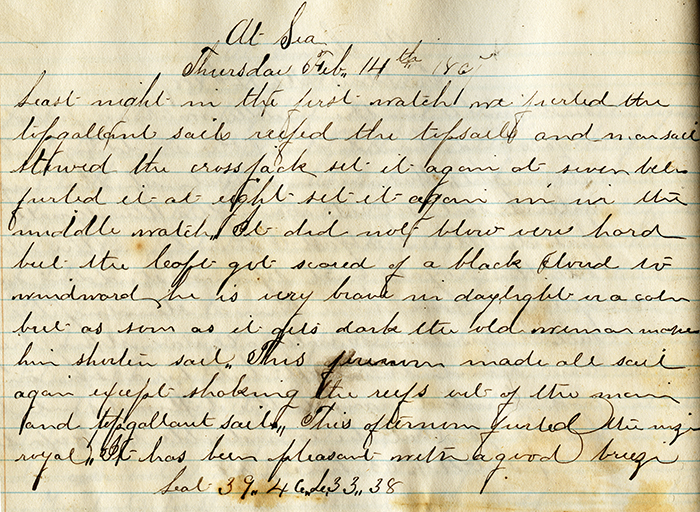 Feb. 10: "There is a good lot of water about decks, I got the benefit of one sea which wet me all over, but I do not care for anything except my rubber boots for I have got a plenty of dry clothes." The wall enclosing the deck of a ship. and hurt his leg so that he is not able to keep the deck." To reduce the amount of sail, or canvas, used on a vessel.."